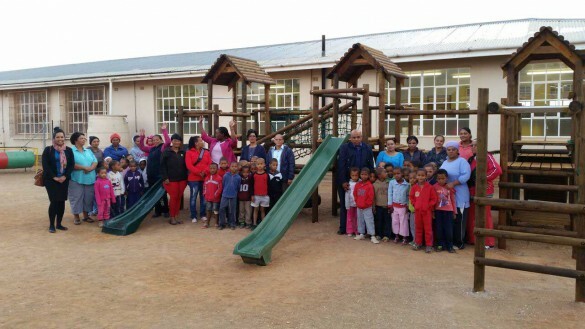 Mainstream Renewable Power South Africa donated playground equipment to Loeriesfontein Primary School. The Grade R learners received the new jungle gym, an important part of the learner’s gross motor skills development programme; as a replacement for the rundown playground apparatus. The timber jungle gym cost over R43 000 includes fibreglass slides, various climbing frames, platform areas with roofs, cargo net for clambering, monkey bars, tyre swings under platforms and tunnelling areas. On receiving the apparatus the Early Childhood Development Practitioners expressed their thanks and commented on the children’s tremendous excitement about the new gym. “We are grateful for the new equipment that our learners can play on, so they can develop as a whole; their excitement is contagious,” they said. “In addition to replacing the jungle gym, we are pleased that we were able to recruit three local labourers to assist in the assembling and installation of the jungle gym,” concluded Mainstream. Mainstream South Africa was responsible for the development of Loeriesfontein Wind Farm & Khobab Wind Farm.